1. Pour the gin into a bowl. Add the thyme and muddle to bruise the leaves and release their flavour. 2. Remove the thyme leaves with a slotted spoon and discard. Add the cranberry and orange juices to the gin, then stir in the tonic water. 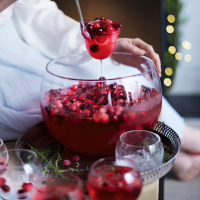 Pour into a punch bowl or jug filled with ice. Garnish with lots of fresh cranberries.